Successfully Added 8 Inch On-Camera LCD Monitor (BNC Video Input) to your Shopping Cart. 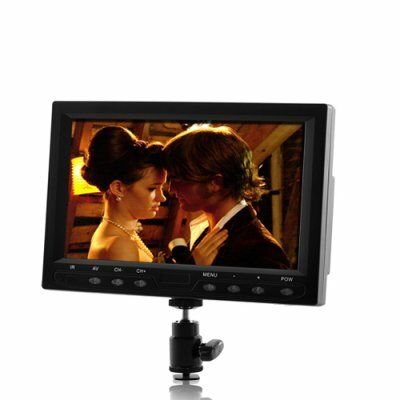 Make things clear and easy for yourself and upgrade your camera with this awesome 8 Inch On-Camera LCD Monitor today. This on-camera monitor is camera/jib/crane mountable through the hot shoe adapter and provides a clear and accurate image of what’s being recorded without having to look through your camera’s tiny built-in monitor. This makes framing, focusing and previewing faster and easier than before while allowing you to position the monitor at different angles without being forced to keep your eye level with the back of the camera. This monitor comes with two BNC video inputs and produces a crystal clear picture and shows colors vividly, even when used under sun light. Additionally, a light-hood is also provided to ensure a perfect picture under excessive lighting conditions as well as image adjustments like tint, contrast, brightness adjustments and more. The 8 Inch On-Camera Monitor comes direct from the OEM factory at a price which is unbeatable on the internet. Order now and we’ll express ship your order and even back this high quality monitor with our full one year product warranty. Brought to you by your source for high quality low price electronics, Chinavasion. Can mount to any existing equipment through hot shoe adapter. Can also be used as an external monitor for DVD, gaming, GPS and more. This monitor can be used on any cameras which have a hot shoe mount and RCA video input.